At 5am every Saturday, as I weigh up the benefits of ditching either a shower or a cup of coffee (those who know me well will know which usually wins out), in the service of an extra 10 minutes of fitful sleep I am liable to ask myself why I do what I do. Why do I spend my Saturday mornings on a cold car park heaving tables and gazebos into place? Because I run a market and that is what market people do (except for those market people with pre-erected stalls who are so lucky they don’t even know they’re born); because I get to spend the rest of my day chatting to traders who have created their own unique businesses from scratch and are passionate about their products; because by the end of that day, between us all – me, the traders, the staff who help us with those gazebos, my fellow market directors who steer the course of the business on the steady path – we have created something that has brought people together – customers, friends, families, neighbours. When I first started working on Levenshulme Market I noticed that at each Market I’d have a goosebumps moment – a stand-out second when I was truly moved by what we’d made – and not long after that I noticed that those moments were all about people – people discovering new products, people laughing, (small) people playing games in a place where games aren’t usually played, people finally meeting their neighbours for the very first time. It was moving then and it’s still moving now – I continue to get goosebumps, week after week. But there is a bigger why. Why run a market at all? What does a market do for Levenshulme? It’s a more complicated answer than I thought 18 months ago and the process by which the Market came into existence – and why we carry on – owes a lot more to that question than those goosebump moments. At the end of 2011 Mary Portas published her review on the future of the high street – 28 recommendations that she determined would help high street retailing recover from the triple battering rams of recession, big box out-of-town retail and the internet. While she never said that markets were the key to her vision for recovery, several of the measures she suggested had markets at their heart, acknowledging the role of that street markets play in driving footfall onto high streets. 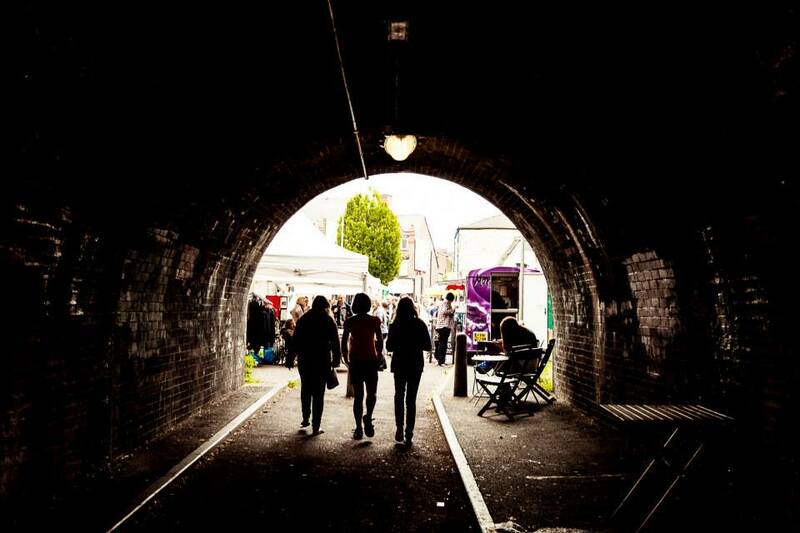 From an implementation perspective, creating new markets on high streets was one of the simplest measures she proposed for local councils to take up – and so they did – including Manchester City Council who piloted a monthly street market in Levenshulme in May 2012. And the market was great. For a while. Residents threw themselves behind promoting the market and making the most of the opportunity and for the first few months, customers came, traders came…and then…a slow downward spiral. Residents who had been giving large amounts of their free time to promote the market weren’t able to continue, fewer customers came leading to fewer stall holders, leading to fewer customers. While the Council’s Market team did their best to support the market, they too were short on resources and after six months the market was deemed unsustainable and those of us who had been involved in the process of developing the offer were told that it would close in December 2012. That September a group of traders, residents and other interested parties sat around a table at the Inspire Centre in Levenshulme and the Council’s South Manchester Regeneration Team asked us a question – do you think you can make this market work? The very short answer (reached after a lot of very long meetings with South Manchester Regeneration, Blue Orchid and those of us who were left at the end of that process) was yes. We had a business plan that would allow us to run and promote a monthly market in Levenshulme and make a meagre profit But the question that became more important (don’t tell the bank manager) was not whether we could do it, but rather, whether we should do it. The discussions sparked by this question have come to define us as a business. So why should we do it?’ Increasing footfall on our local high street was one incentive and the Market certainly raises footfall on the high street in Levenshulme, and now that we are a weekly market that impact has increased. We are, however, keenly aware that the people who come to our market are not necessarily natural shoppers at all of the existing businesses on our high street and that any amount of increase in footfall will only translate to money spent on the high street if those shops are prepared to put in the hard work to attract these customers into their premises. As directors of the Market, we are happy to work with those businesses that want to use the opportunity provided by the Market to promote their business in Levenshulme and to share customers with us. Several local businesses have taken advantage of this, to excellent effect. What interests us to a greater extent, though, is the role that markets can play in incubating businesses. Most people know that Alan Sugar started his business life trading on a market stalls, but did you know that Marks & Spencer started as a market stall? Or that the founder of B&M Bargains cut his teeth on his parents’ stall? Markets are the lowest risk way for new retailers to learn the skills of the trade, refine their products by getting real time feedback from their customers and to build relationships with more seasoned traders who have learnt their lessons the hard way. And Levy residents have already started to respond to the opportunity the Market presents – three new businesses have been established as a response to the Market and several of the businesses that have been trading on the Market for a while are now confident enough in their product that they are looking for high street premises…in Levenshulme. But there is more – and we want to do more. As far as I can tell there is absolutely no research on the tangible impacts that markets have on high streets (nice PhD in there for someone, I’d say) – while Portas and Bill Grimsey (in his 2013 review on the alternative future of the high street) tout markets as a good thing and our instincts tell us they are right there is very little tangible evidence as to why they are. Some six months after the Market started trading the Centre for Cities’ September 2013 published their report, Beyond the High Street: Why our city centres really matter. Their insights sum up what I consider to be the guiding principle behind how we operate at Levenshulme Market: they determined that underperforming high streets are the symptom of economic malaise in the areas they serve – or, in other words, bad high streets don’t happen to communities where money is circulating properly. We believe that markets address that problem. Markets allow local people who are not earning enough to spend locally to create businesses to increase their income so that they can. They allow local market traders to become local businesses to create jobs and give more local shopping opportunities. They allow local shoppers to support their fellow locals and create more jobs. It’s a virtuous circle and although it’s not perfect it can work and markets – done properly – are at the heart of it. We recognised that early on in our discussions, and so, when the time came to decide how we were going to incorporate ourselves and what we would do with those meagre profits, it was clear that we had to be a social enterprise. This means reinvesting our profits back into the trading community by providing financial awards to locals who were potential new traders on the markets in order to help them create their businesses, or to existing market traders who wanted to make the leap to bricks and mortar premises on our high street. And it turned out that those profits needn’t be as meagre as first we thought – the story of how we got to this point is a whole other blog post in itself, but the good news is that at the end of 2014 we expect to have netted £15,000 to be allocated to such awards for traders – thus proving that markets really can make a difference to high streets. Levenshulme High Street is designated as one of three “failing” high streets in Greater Manchester and there are many more like it all over this country – low occupancy, dominated by betting shops and takeaways, providing little in the way of income to residents. While, however, employment figures are low, entrepreneurial spirit is high and business lending is beginning to improve – these are perfect conditions for a boom in startup retail businesses, and yet it’s not happening. There is a massive disparity, and markets address that disparity – and the business model we have developed helps to push forward the process of repopulating our high streets. So that’s why. That and the goosebumps – they’re pretty cool too. 19th April – Easter Egg Hunt! ¡Arepa!¡Arepa!¡Arepa! …don’t you just love it when your traders become successful?